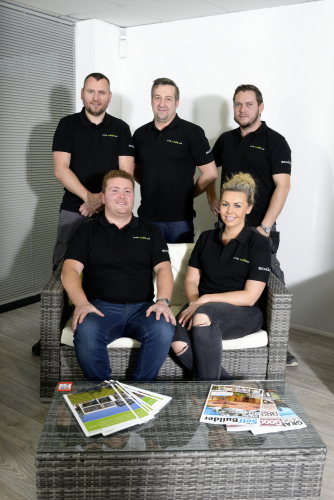 We were recently interviewed by Schüco for their UK Trade Residential magazine! Have a read of the article below and find out more about the company and what we do. Oliver Aldersley is the Managing Director of Lite Haüs UK Ltd, a company he founded in 2011. 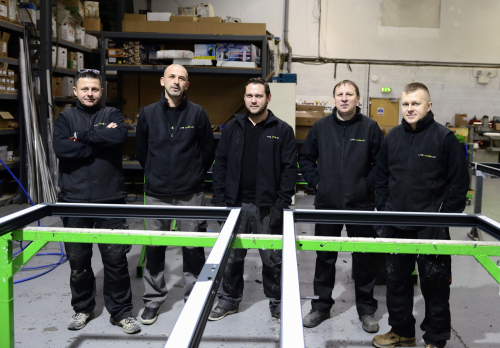 Today, it is a rapidly expanding business specialising in the fabrication and installation of a wide range of top-quality aluminium products. Based in Coventry, Lite Haüs UK serves mainly domestic residential customers all over Warwickshire, the West Midlands and Leicestershire. What made you choose the company name? It was a family decision over Sunday lunch! We’d researched the products that we wanted to sell and Schueco was our first choice. We wanted a name with a connotation of German engineering and eventually came up with Lite Haüs. It was German-sounding– rather like Huf Haus – with the ‘Lite’ picking up on some of Schueco’s own phrases like ‘Let the light stream in’. How large is the company today? Considerably larger than it was in the first year! The growth has been massive. We have gone from a £50,000 turnover to an estimated £1.5m. It hasn’t been easy but we’ve achieved the growth we wanted. We’ve got about 16 employees and four management roles. I do sales, Lyndsey runs accounts, Maciej is processing and production – he does all our LogiCal and he runs processors and the CNC machine. And then we’ve got Mirek, who is our shop floor manager – he runs the team on the shop floor. Finally, we’ve got Adam who oversees the installations and runs our site surveying. How many are on the shop floor? Between 8 and 10. We’ve got two members of staff that ‘float’ so they can install or go and help wherever they’re needed. 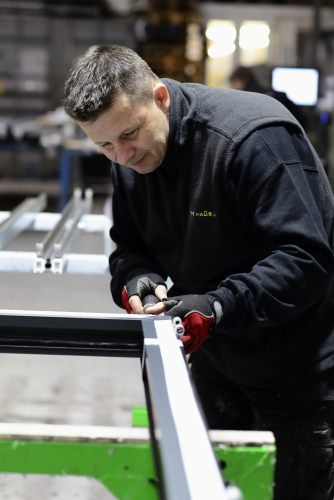 We also are aware that some of the products aren’t easy, so if, for example, we do a bespoke job like a retractable corner post or a glass-to-glass corner, we tend to send a fabricator on site. So there are two installers (we have two installer teams) and the guy who’s fabricated that job. And what do you sell most of? 80% to 90% are bi-folds. We’ve seen a big change in the market in respect of customers looking at sliders. We’ve had a lot of people coming in to enquire about sliding doors – but they don’t always suit the project. A lot of customers come in looking for a slider but they go away with a bi-fold because it’s more practical for them. A slider has to be in a large opening to achieve the sort of panoramic ‘big glass’ impact they’ve seen in brochures. But sliders are going to be a big thing because they’ve got fewer sight lines than bi-folds when they’re closed. Very important. I think the idea that ‘German’ equates to ‘Quality’ is the norm everywhere from the car industry all the way down to cookers, hobs and kitchens. People respect German engineering. You only have to touch a Schueco door to know it has the edge over other systems. What do you think about the Schueco AWS 70 window? It’s filled a gap in the market for Schueco. It’s a good window. The lift-and-slide door has the ‘wow’ factor, the bi-fold has the ‘wow’ factor. How much ‘wow’ can a window have? It’s not a tilt-and-turn, it’s very basic. It’s doing exactly what Schueco brought it out to do. It’s more cost-friendly than some Schueco products and that’s helped us sell it. What guarantees do you give to your customers? We give 10 years on all our products. We are looking at increasing the guarantees on certain products but obviously we can’t on others because not all systems houses will offer matching guarantees. What geographical areas does the business cover? We try to limit travel times from around 45 minutes to an hour. We feel after that we can’t give the customers the service they deserve. If we do go further afield or we have a customer that’s doing a job out of the area, we will undertake that work for them, but we will charge them extra. The biggest thing is aftercare. It’s all very well everyone selling nationwide, but what happens if there is an issue or if a customer needs support? If they’re two to three hours away, they’re not going to get the service we sold them in the showroom and I don’t think that’s fair. People are buying a luxury product, not a necessity, so the whole experience needs to be right for them. Do you receive any enquiries from Schueco UK? Yes. In the form of emails. They’re kept regional to keep it fair. We also pass leads on to other Schueco partners. For example, we don’t cover London but we have a lot of interest from London, so we push those enquiries back to Schueco partners we know will service those areas. When you researched the products and determined that Schueco quality was superior, did you look at alternative systems? I don’t think we needed to. The quality was obvious and the only issue I had was, Schueco is a German company, so how closely can we work together? In fact, we have a more personal relationship with Schueco than I thought we would. Schueco’s a family business and I think that shows. For instance, the biggest problem for any business is cashflow – it can be a real stumbling block – but we’ve been able to work with Schueco with credit limits, with payment terms, staged payments etc., to enable us to get products on the shop floor. So, we owe a lot to Schueco, especially in the accounts area. How have you marketed yourselves? Originally, word-of-mouth but over the last two or three years we’ve invested heavily in marketing – like the website, Google and so on. We now use an independent marketing team and that’s working really well. In this coming year, what plans do you have for the Schueco marketing support budget? Advertising, product research – looking at new products, determining whether they’ll sell or not. We want to look at the Schueco front door and the new panels you’ve introduced for it – that sort of thing. A snippet of our 4-page interview in Schüco Resi 02 2017 – The Schueco UK Trade Residential News Update.